Engineered wood provides a luxury, real wooden floor surface at an affordable price. Most manufacturers employ a click-lock system ensuring the smooth surface has life-long stability. The surface layer lends itself to smooth finishes and is robust enough to accommodate numerous sandings throughout the life of the floor. Alternatively, why not treat yourself to a sumptuous, solid wood floor. You can sand and reseal it as often as you please and watch it develop the unique beauty of aging wood, over many years. Parquet floors comprise small wooden blocks laid in a traditional pattern or your own unique design. Although they have always been fashionable, they are currently experiencing popularity, unseen since the 1930’s. See our display of modern parquet flooring designs in store. 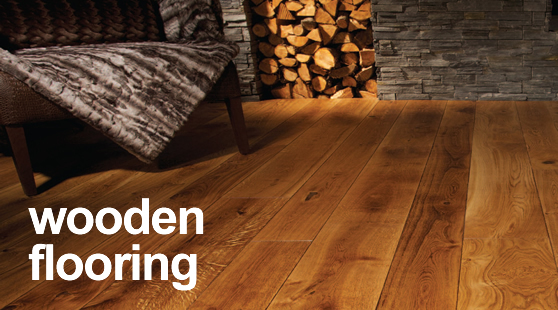 All engineered and solid wooden flooring comes in an extensive range of finishes including natural lacquers and oils. It does not stop there. You can choose from an enormous variety of different woods ranging from the traditional to the tropical. For example, Oak, Maple, Birch, Beech, Ash, Cherry, Walnut, Rosewood, Merbau, Jatoba, Jarrah…the list is endless. Our skilled carpenters are highly experienced in fitting all types of wooden floors and are completely unphased by adventurous design challenges. As with all our products, we refuse to supply poor quality material so you can be confident you are left with a perfect, long lasting floor to be proud of. We are also keen to supply ethically-sourced woods and you will find most of our suppliers comply to this standard. Curious? Come and browse through the possibilities at our showroom. You are welcome to take home any wood samples that you like, to try at home before buying!